Macarons are elegant French cookies. 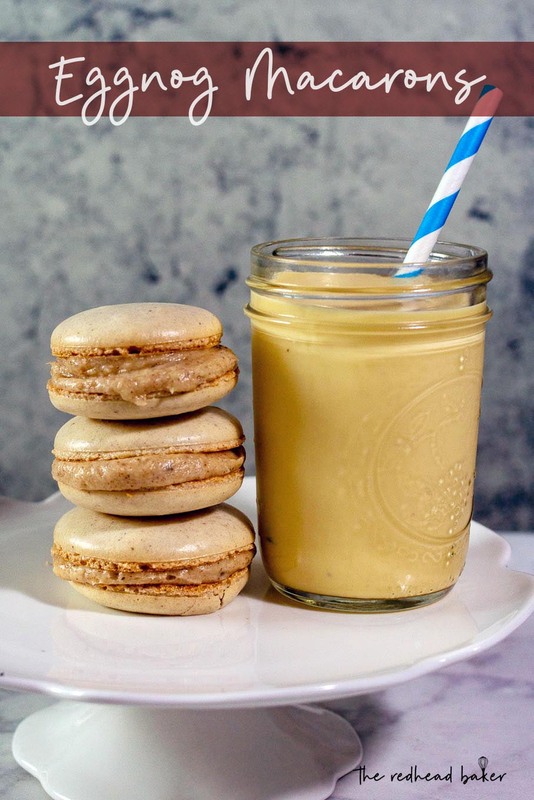 These eggnog macarons consist of a light and airy nutmeg-flavored shell with creamy eggnog filling. Macarons. So beautiful! So delicious! So intimidating for the average amateur baker! But they really shouldn’t be. They don’t involve any difficult techniques. It’s just a matter of getting the consistency of the batter right. It’s just a matter of practice. And really, even if you end up with cracked shells, or shells with no feet, you still have delicious cookies. So, keep practicing! These delicate shells are baked on silicone baking mats (or parchment, if you don’t have silicone baking mats) like the ones made by our sponsor, Silpat. 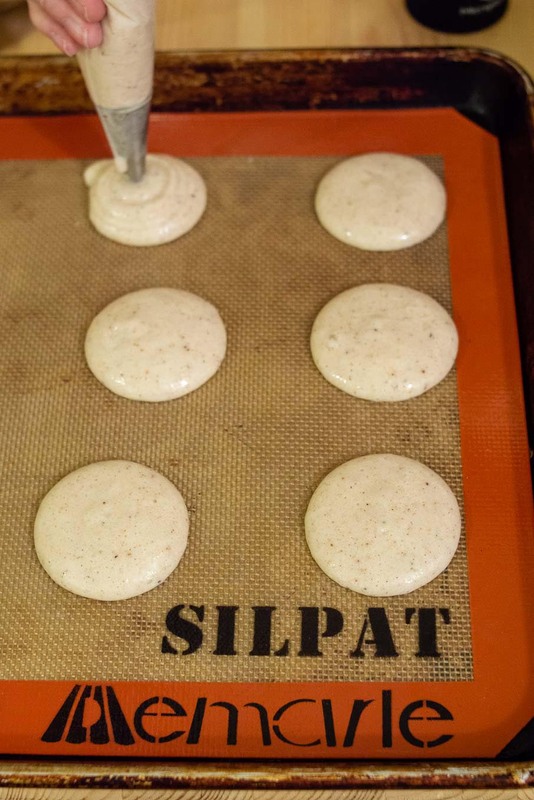 I bought my first Silpats in a culinary store in Paris over 10 years ago. I love baking all kinds of cookies and pastries on my silicone baking mats. They are very easy to clean, and less wasteful than disposable parchment. I also highly recommend weighing your ingredients. Baking is a science, and weighing ingredients is far more accurate (and less messy, I find) than volume measurements. 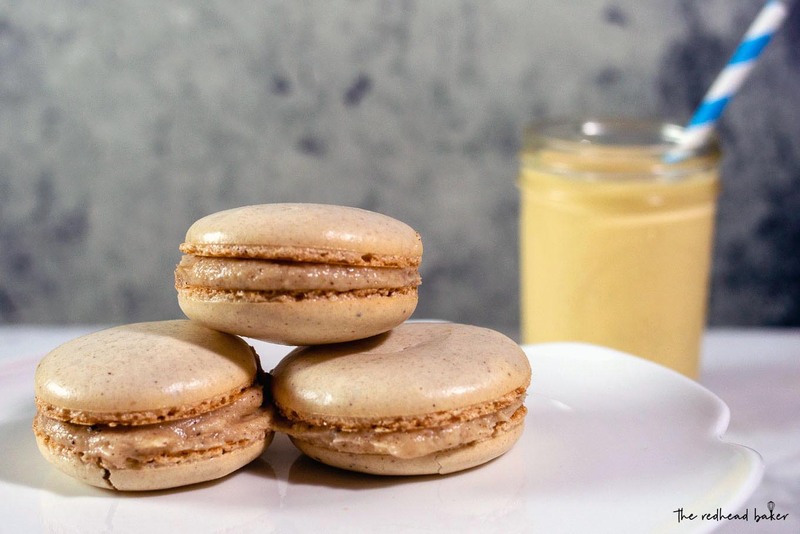 Macarons require a certain consistency, and too much or too little of your dry ingredients will affect that consistency. My first batch of shells came out of the oven without any feet. The most likely culprit was that my batter was under-mixed, because I didn’t test the batter (see Step #6 in the directions for how to test the batter) before piping it out. My second batch came out over-cooked, because my oven runs hot, and I didn’t check the actual temperature of my oven with my thermometer against what temperature I had set the oven to. The third time wasn’t quite the charm, but it was the best of my attempts. The edges were still slightly more brown than I would prefer, but they did have little feet. You might wonder why I didn’t add the eggnog flavor (mentioned in the filling ingredients) to the macaron shell batter. That’s because it’s oil based, and would break your meringue. That’s why it’s in the filling only. 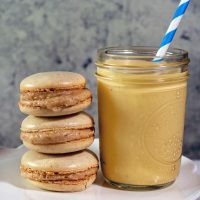 So, I hope you will give homemade macarons a try, and enter to win some of the prizes from our #ChristmasCookiesWeek sponsors for your holiday baking! Preheat the oven to 300° and have ready a large (18”) pastry bag, fitted with a plain tip. Line two baking sheets with Silpat silicone baking mats. Sift together the almond flour, confectioners sugar, nutmeg and cinnamon. Set aside. In the clean, dry bowl of a stand mixer, combine the egg whites, sugar, and salt. Whip on medium speed for 3 minutes, increase to medium-high and whip for 3 minutes, then increase the speed slightly more (not to the highest speed) and whip another 3 minutes. The meringue should be good and stiff (it should form a peak when the beater is raised, and the peak should not tip over at the top). If your meringue is not stiff, continue whipping another minute. Add the vanilla extract and whip another minute. The meringue should appear very stiff, and slightly dull. Take the mixing bowl off of the stand mixer. Add the sifted dry ingredients, and fold them into the meringue with a rubber spatula. Unlike other folded batters, you want to deflate the meringue as well as combine the flour mixture into the egg whites. Take a spoonful of batter out of the bowl and drop it back into the bowl. The batter should mound upon itself, but melts back into the rest of the batter after about 20 seconds. If it just sits there, never re-incorporating, you're macaron batter is undermixed. Continue folding. If it is very runny and doesn't mound upon itself, it's overmixed and I'm sorry to say, you need to start over. Once your batter reaches the correct consistency, fill your piping bag halfway with batter. Pipe circles 1 to 1 1/2 inches in diameter on your Silpat. Once you've filled the sheet, rap it hard on the counter, turn 90 degrees, rap again, turn 90 degrees, and rap a third time. Repeat with second baking sheet. Set the baking sheets on the counter to rest for 30 minutes. Place in the oven and bake for 18 minutes, rotating the baking sheets 180 degrees and switching from to bottom halfway through baking. 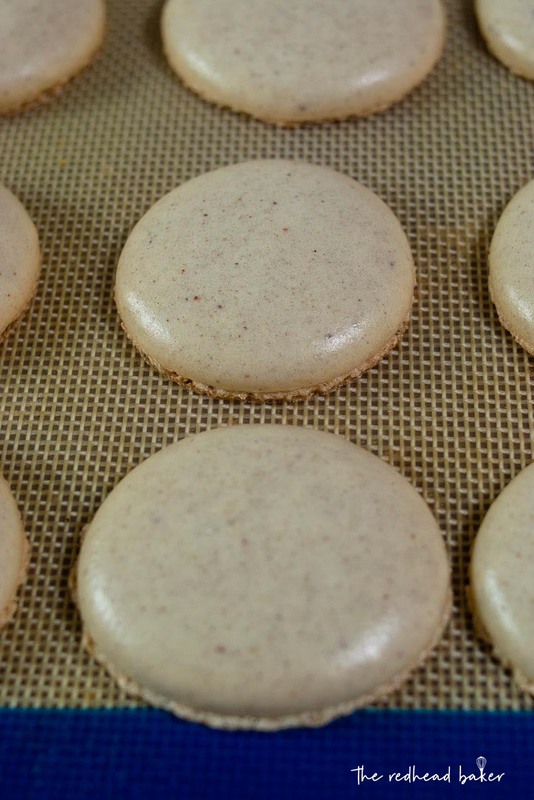 The macarons are done when they can be peeled off of the baking mat. Remove the baking sheets from the oven to a wire cooling rack and let the macaron shells cool completely on the baking sheets. Then peel the shells off of the silicone mat. Beat the butter until smooth and creamy. Add the eggnog flavor or rum extract and beat to incorporate. In another bowl, stir together the powdered sugar, nutmeg, cinnamon and salt. Add to the butter mixture and beat to incorporate. The mixture will look dry and crumbly. Add the eggnog and beat until incorporated. Increase mixer speed to medium-heat and beat another minute or two. 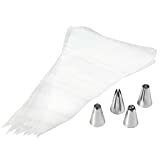 Fill a piping bag fitted with a star tip halfway with the filling. Pipe a tablepoonful or so of filling onto the bottoms of half the macaron shells. Top each with another macaron shell of similar size. Store in the refrigerator for up to a week. I’ve been terrified of macaroons, but I think I’m going to give this a try!